Marrets typically offers 'cool' 3 bedrooms private vacation homes prepared for the convenience of a family that wants a home away from home, or a group/team who prefer to stay together and save money, work on a common project from the comfort of their home. or for any other reason. Our Accra, Ghana Vacation Home is located at Dzorwulu, near the Airport Residential Area, conveniently facing the First Class "N1" Highway aka "George Bush International Highway". 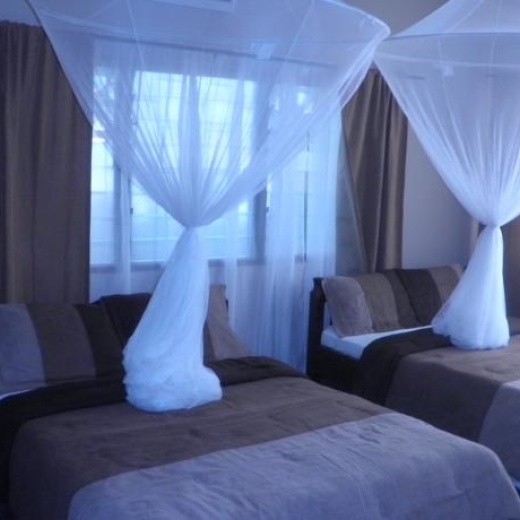 It is furnished with an excellent blend of North American, European and African touch and suitable for vacationing families, business travelers exploring the rich business climate of Ghana. All Marrets facilities are secured. Many are under 24/7 watch by professionally trained lifeguards. They typically offer heavy iron gates/rods behind every external door and window. Many of Marrets neighborhoods are typically patrolled by the local police and are family friendly areas. Access to transportation to desired locations, such as shopping centers, takes seconds. For example, our Accra vacations home is located within 5 minutes drive from the largest Shopping Mall in Accra - (Shoppe Rite Mall).